ViewSonic Corp. introduces new digitizer touch modules for Virtual Teller Machine (VTM) solutions. The modules, ranging from 5-inch to 21.5-inch, provide digital biometric signature capture capabilities with ViewSonic’s exclusive battery-free V Pen, allowing the financial industry to implement authentic e-signature capture and recognition. VTM solutions provide support for cash transactions, fund transfers, account transactions, as well as digital biometric signature capturing. 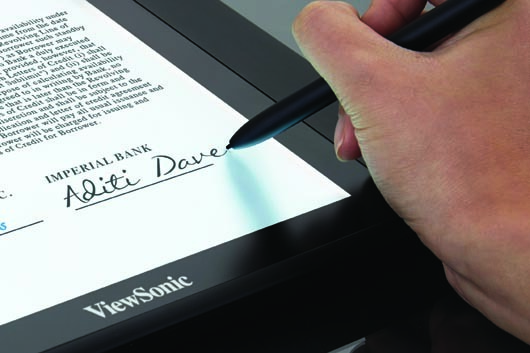 ViewSonic’s pen modules can record biometric data for e-documentation, provide accurate e-signature storage, and secure encrypted digital signatures. Available with a full suite of SDKs and API, the solutions can be quickly deployed into any environment with features to give banks the ability to provide round-the-clock counter services without the limitations of traditional bank branches, in terms of time, location, and limited personnel. For banks, these solutions can drastically reduce operating costs and service time, increase customer turnover, and improve customer satisfaction. With an accuracy of 200 points per second (PPS) and 5,080 lines per inch (LPI), every detail is precisely captured and reproduced on the display. Featuring 2048 highly-sensitive pressure levels, the battery-free V Pen replicates traditional ink signatures with additional levels of security, only available to fully digitalized signatures. In addition, the digitizer touch modules are compatible with optical touch or projected capacitive touch, which allows for dual-touch functionality. With total VTM Solutions, banks can deliver enriched, flexible customer service, and can efficiently expand their presence, without increasing their costs.